Sugaring areas commonly requested for the face include the forehead, nose, upper lip, chin, cheeks, sideburns, and ears. This is ideal for women, along with full face sugaring. This treatment simply involves removing unwanted hair in all areas, from your forehead to toes (Except male private areas) . 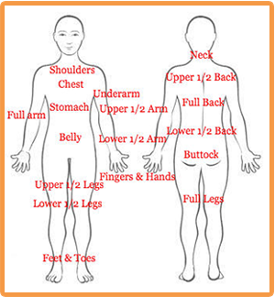 We offer two different types of sugaring treatments for bikini sugaring. The first is a standard bikini sugaring, which removes the hair from the sides of the bikini line and top, with nothing taken from the inner knicker line of the buttocks. The other style is extended bikini sugaring, which removes hair further in than the sides of the bikini line, with more hair taken from underneath. 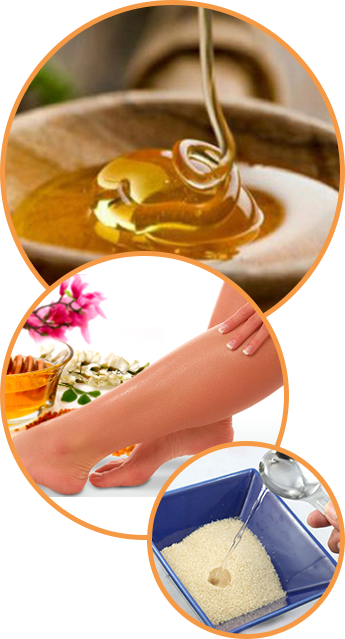 We also have two types of Brazilian sugaring treatments. The Brazilian Hollywood completely removes all hair from the pubic bone all the way to the back, leaving nothing. The Brazilian strip removes all hair from the pubic bone to the buttocks, except a small strip in the front. You have the option to remove all hair from underneath, as well.